BodyPump is a group exercise that provides a total-body muscular endurance workout, utilizing adjustable weighted barbells and aerobic steps. It is a dynamic workout with pumping music in the background and an instructor providing constant feedback and encouragement. The purpose of this 60-minute exercise program is to lose weight and tone muscle. According to the Les Mills website, "class members can burn up to 600 calories a session." Calorie expenditure differs for each individual due to age, weight and gender factors. Since the human body is designed to adapt, doing the same workout of any kind over time can vary calorie expenditure. The body becomes more efficient in burning calories for a certain workout over time, thus lowering the amount of calories burned per exercise bout. Participants should increase the weights lifted as they proceed in the class to continue to burn more calories. To prevent boredom and to combat calorie burn efficiency, Les Mills, the organization that created BodyPump classes, periodically distributes new versions of BodyPump. 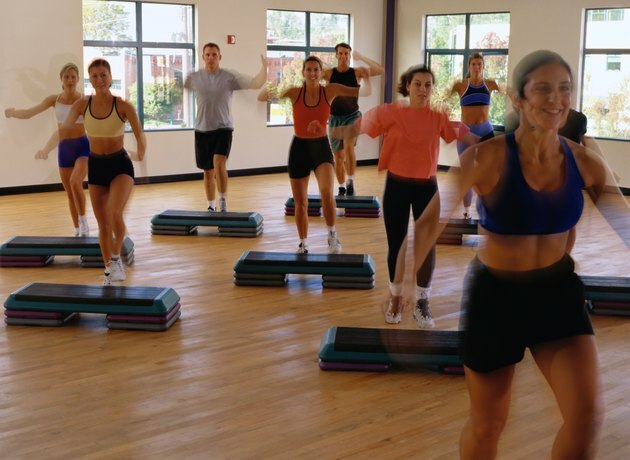 Classes are available at fitness centers, colleges and universities. The Journal of Strength and Conditioning Research; Improvements in Metabolic and Neuromuscular Fitness After 12-Week Bodypump Training; Camila C. Greco, et al. How Many Calories Burned for 10 Minutes Trampolining?